San Francisco's popular bakery Mr. Holmes Bakehouse has arrived in Highland Park, offering phenomenal pastries that include their famed cruffin. 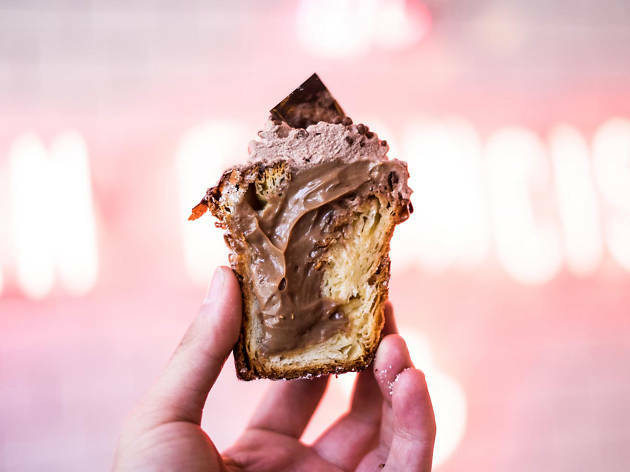 What is a cruffin, you ask? Think of it as a croissant in muffin form, flaky and soft and filled with creme or jam. You'll want to snag a couple of those, but also the bacon and onion danishes, muffalettas and churro croissants. Pair with a coffee and you'll be on a sugar high for the rest of the day. Make sure to get to the bakehouse when they first open (maximum two hours after) in order to be able to try the infamous Cruffins. If you don't make it in time, not to worry, try their strawberry and jalapeno croissant. It is great to have the best of San Francisco bakeries open up branches in Los Angeles. Especially since I did not get a chance to try Mr. Holmes Bakehouse's infamous specialty, the cruffin, when in San Francisco, I made a trip soon after opening to pick it up in their L.A. store. The first attempt, they were sold out by late morning with a sign on the door. I stopped by 3 more times and heard that people were arriving at 8:00 when they open, paying for their cruffins (limit of 2 per person) and then lining up at 9:00 again to get them fresh made. I could not coordinate such an elaborate effort but opted to wait a few months and try again. The cruffin is a specialty made hybrid between a croissant and muffin, which is filled with flavored creams or jams. The flavors change weekly, and are posted online (their website and on Instagram). I was able to try 2 of them. A friend gave me a taste of the pumpkin cream, which was subtle on both the sweetness and cream. When I went on my own, I tried the banana cream, peanut butter, bacon - all good flavors and they worked well together. It took 5 times, but I am not disappointed because I got to try some of their other delicious baked goods. I loved their corn flake cookie, crunchy with corn flakes and comforting with brown butter and toffee. The monkey bread is not too sweet nor sticky, which I appreciated. My favorites though, were the savory pastries. I tried the muffuletta danish, containing all components of this famous New Orleans sandwich. The cheese and herb bread pudding also impressed me, especially when the staff member suggested I reheat it in a pan with butter and top it with a fried egg. Delightful. The coffee was outstanding, and washed down the pastries well. I was most impressed with the exquisite design of the shop, mostly in black, white, pink and gold. It looks extremely clean and elegant with a style that screams for Instagram photos. The staff was very nice and enthusiastic, yielding a very happy experience. I didn't want to believe the hype, but the pastries here are just phenomenal. The cruffin is the go-to—and for good reason—but I was really impressed with everything else on the menu, especially the savory croissants and Danishes. Just brace yourself for lines.